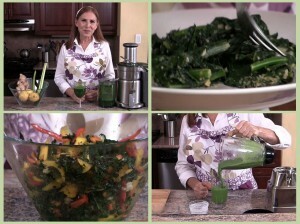 REAL founder, Caryn Hartglass shows you how to get more greens in your diet: juiced; blended; raw; steamed. Can’t wait to try ALL these recipes. I love my greens! Go, Caryn. You are the BEST! You bet it is! Thanks for some new ways to prepare! In regard to the first video, your comment concerning having to clean the machine, beautiful. Thank you very much, Robert. Re: Juicing. Do you do anything with the pulp, or do you just throw it away? Which is more important, in general, and especially during cancer — juices or smoothies? I juice sporadically (will be doing it much more now) and always feel so wasteful throwing the pulp away. I recommend juicing when in a healing crisis or needing quick energy. The juice is easily digested and gets into the system quickly. Juicing is a great way to get lots of nutrition in the body quickly. Yes, the fiber is important, which you get in the smoothie, but you can consume more vegetables, and as a result get more nutrients when you juice.